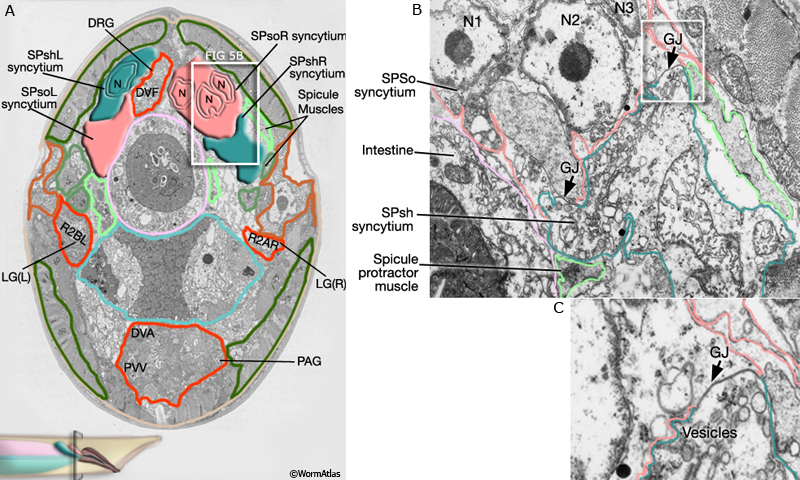 An alternate name for the most anterior of the P ectoblasts, which divides in the early larva to produce ventral cord motor neurons and hypodermal cells. A common behavior in nematodes, in which individual animals leave crowded regions on the culture plate to explore elsewhere, possibly to avoid an aversive stimulus exuded by starving animal or to find alternate food sources. Wandering animals will often burrow into the agar or leave the surface of a culture plate and either die upon drying out on the plastic dish or become trapped in a liquid droplet on the dish cover. Dauer larvae are especially prone to wandering. This term is also used to refer specifically to a male behavior in which a male will stay on a food source in the presence of hermaphrodites, but will wander away from the food in search of a mate in their absence (Lipton et al., 2004; Emmons et al., 2005). 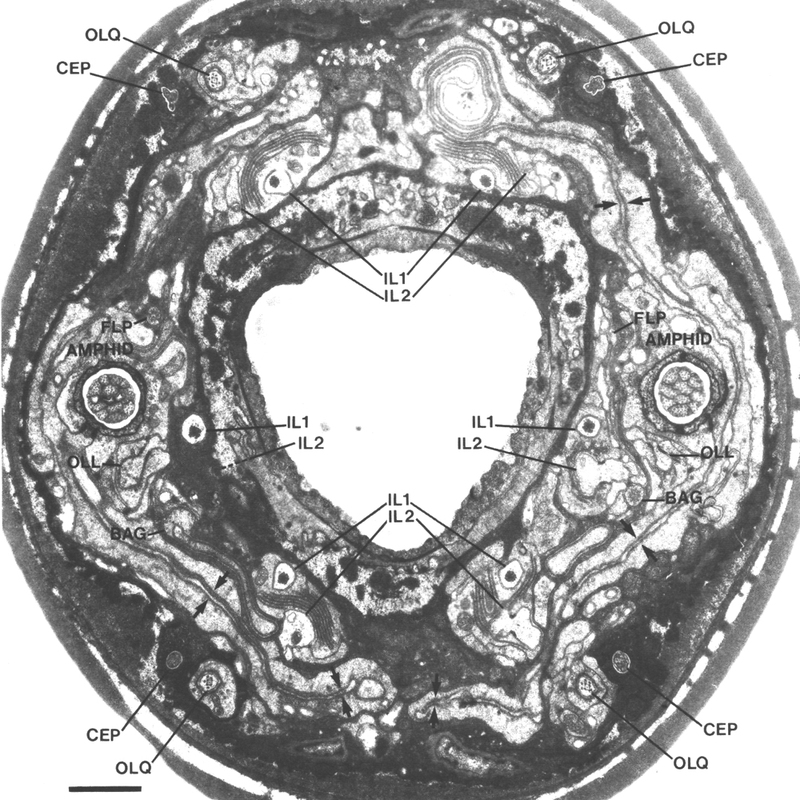 A characteristic late stage endosome that is common in the nematode hypodermis and seam cells (White, 1988). Larger than a multivesicular body, and usually football shaped, this membrane-bound organelle contains stacked sheets of membrane. See left seam cell in SlidableWorm#740. A transmembrane protein complex that acts as a transporter channel permeable to the transfer of water molecules across a lipid bilayer. Size (depth) of the body bend during locomotion. Behavior exhibited by dauers where they "stand" on their tail on whatever substrate is available and "wave" their body. It is thought that this behavior aids in being picked up by another organism to be carried to a new location. The long flexible tip of the hermaphrodite tail, beyond the phasmid openings. A structure, often membranous, that starts at one point and wraps around that point in an expanding circular pattern. In C. elegans, membraneous whorls have been found in cells undergoing degenerative cell death (Hall et al., 1997). The normal (non-mutant) form of a species, as found in nature. A category of sensory neuron having a broad flattened (sensory) ending associated with the amphid sheath (AWA, AWB, AWC). These cilia form large wing-like structures and share the lumen of the sheath cell (Perkins et al., 1986 - see arrows). The adult male PHso1L and PHso1R cells have a branched morphology and have also been referred to as "wing cells", possibly due to the manner in which they insert a distal process into the phasmid sheath which is similar to the insertion of AWA into the amphid sheath. The PHso2L and PHso2R cell pair have also been called “wing cells” in the hermaphrodite tail (Hall, 1977), where their distal process forms a thin wrapping structure around the phasmid socket cell. A mapping of synaptic connections between a set of neurons and muscles. See Neuronal wiring in WormAtlas. A special group of cells in the gastrulating embryo, who ingress in concert, just prior to another cell group called the “central cells” (Nance and Priess, 2002).